Two men have been arrested after an armed robbery at a post office in Bedford this morning (Friday). Armed officers and the force helicopter were deployed after two men, brandishing a weapon, held up the London Road post office at 9.10am. They made off with a quantity of cash in a getaway vehicle, which was then spotted heading south on the A6. 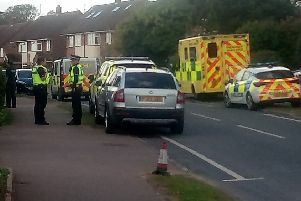 Police chased the vehicle through local villages before heading into Stotfold where the two men then attempted to getaway on foot but officers caught up with them in Baldock Road at around 9.40am. Forensic work is being carried out and house-to-house enquiries are ongoing. The stolen money has been recovered. Bedfordshire Police would like to hear from anyone who witnesses the robbery or saw two men leaving the vehicle in Stotfold. Call police via the non emergency number 101 or text information to 07786 200011. Alternatively contact Crimestoppers, anonymously, on 0800 555 111. >Two men, aged 25 and 52, have been arrested in connection with the incident.